Sunday Notes: Is the Easter story too scary for children? Having just celebrated Easter, I noticed a definite preference for bunnies and chocolate than the events surrounding the death and resurrection of Christ. Beliefs aside, I wonder if it’s because we feel death is too hard for our children to understand… bunnies are better… right? I could understand her point, as a mother, I have wanted to protect my children from the death and evil in this world as much as anyone. To focus on the good is the most natural thing in the world. My four-year-old refers to Jesus as ‘baby Jesus’, so to explain to him that the man hanging on the cross is Jesus grown up wasn’t the easiest thing. But I explained it as simply as I could, and he grasped it. He said it was sad and in the same breath talked about Buzz Lightyear. Watching the news with my 10-year-old son, my heart was broken to see tears roll down his cheeks at the fighting in Syria. The confusion on his face as he watched news story after news story about humans terrorising each other not just in far away countries but in his own county. The evil in this world shown on TV is far more distressing than the story of Jesus. My younger son starts school this year and already I’m saddened at exposing him to the big wide world that is school life. The anxiety as he learns new things and his world expands, the struggle of trying to find his place among a classroom and being told off for not doing the expected thing. School of course, has so much excitement to it, but I know that it brings fear and worry too. But of course he must do it, to live a protected life away from other people is not to live at all. I want him to find his way to God through an understanding of what happened, not that Jesus brought him some chocolate. At Christmas, we throw ourselves all in… with bells on. Christians and non-Christians alike gather gifts and decorations to express their joy of the season. The school plays often feature a nativity where the children learn that a baby was born and that’s why we are all doing this Christmas thing. It’s an innocent, happy occasion. A baby Jesus is the most harmless image in the world. We are comfortable with a chubby baby, gentle shepherds and donkeys. Easter, which in the Christian church is like Christmas with extra tinsel, is the marking of the resurrection of the King. The cornerstone of our beliefs. It’s our biggest day. But Jesus’s death must come first. I attended the Good Friday service at my church as usual and saw familiar faces and a reasonable attendance, but it was nothing exceptional. There were a number of empty seats. The Good Friday service is reflective but there are hymns and crafts for children and we think about the way Jesus’s death relates to our lives, to who we are. As a bereaved mother, I often think of Mary watching her son be strung up by these hunters. And, while my own grief is opened up, I take immense comfort from this. Still, it’s about death, no one really wants to talk about that bit. Why celebrate death? Where is the love in all this? Can children not cope with the evil in this world, the evil way Jesus was killed? I find that they can. I have struggled myself in the past to explain the story to my children, I know it’s not easy. But children can handle far more than we realise. My children aged just 5 and 10 had to handle the sudden traumatic death of their much loved sister at home. All children will experience a personal loss of some kind. I like to teach them that because Jesus was God, he knew that the people wouldn’t understand and would be scared so they would kill him, which is an emotion where most of the evil in the world today comes from anyway. But he also knew that he would come back to life, not as a spooky ghost but as a living breathing man. I teach them that because he is God, he came back to show us that he loves us and has a wonderful place for us to go to, when it’s our turn to die. Celebrating is great, but sometimes we can learn a lot from the tough stuff. The Easter story is not meant to be frightening, it’s meant to be the most hopeful, comforting story we humans have and that, in my opinion, is the most important story of all. I’m weaning my baby, see you in six months! So I’ve made it to the six-month mark. Hooray! As much as I love newborns (I’ve been blessed to have five after all), I find it exhausting, especially with a toddler too. 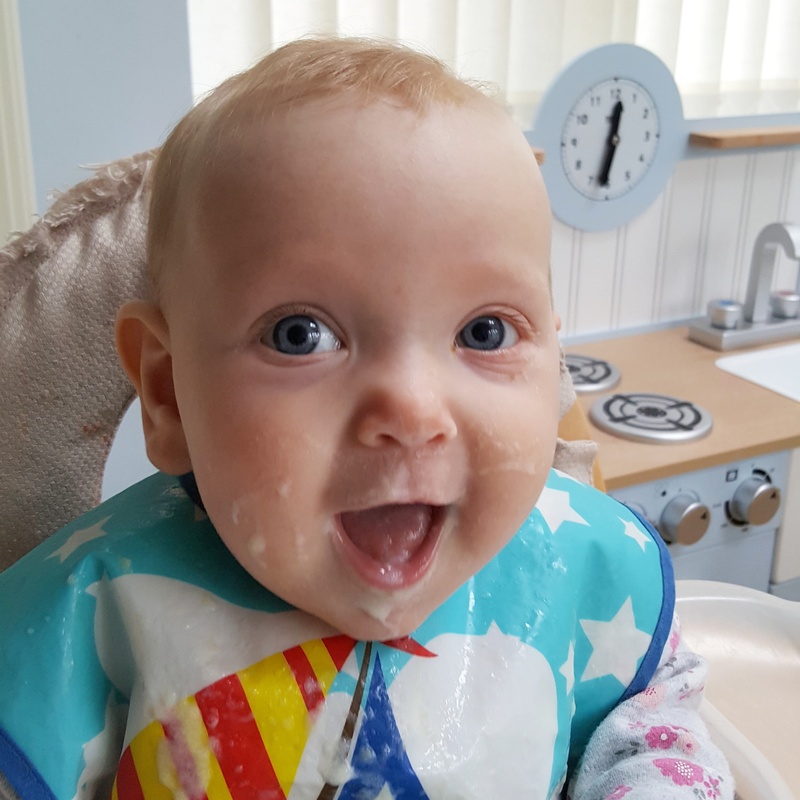 I know that six months is a key stage when weaning can get more established, the baby might sleep longer at night and is generally more sociable (i.e., I can give her to someone else for more than an hour!). It might sound harsh, but as much as I love my bambinos, being a parent on call 24/7 is the hardest job there is. Weaning means I can get out a bit more…. oh, hold on, I’ve just remembered, no, it doesn’t! …to gallop into the second half of the first year to find yourself spending it pretty much in your kitchen. Suddenly, the thought of breastfeeding on the sofa watching daytime telly because you’re pinned under a cranky baby seems appealing. You realise that all the progress you’ve made is swapping one room of your house for another. When my husband comes home from work and asks me in a jolly ‘I’ve-been-out-all-day talking-to-adults-and-drinking-hot-tea-in-peace’ voice what I got up to today, I look at him ‘adoringly’ with bits of apple puree in my hair, milky dribbles on my shoulder and a cranky baby on my hip whilst stirring a pot of random homemade sauce on the hob and say ‘not much’. The feeling of being unproductive is pretty dire for me, as I like to feel I’ve achieved something. When I look back and realise that all I’ve done is feed, change and wipe up all day, it’s not really much to shout about. Yes, there are fantastic moments scattered throughout all that, I have brilliant quality time with them, but I can’t help feeling that most days I’m a robot doing the same thing from breakfast till bedtime. Let me explain the average day. By the time the baby has had breakfast and been changed, the toddler wants changing. Then I need to get dressed and have my own breakfast and clear away the breakfast things that the others left behind. Then the baby needs her mid-morning bottle, and she wants a nap. Then the toddler wants lunch. Then the baby wakes up and wants her lunch. Then they both need changing again. We have about an hour or so before she wants another bottle and, oh look, it’s 3pm; Joe will be home in a minute and I have to collect Jen from school. We go outside, briefly, in the car to collect her. Then whip up a culinary masterpiece that they all will love quickly make a meal that they are guaranteed to moan about, and give the baby and toddler a snack. I change them both, then it’s 5pm and the joys of getting the meal on the table. Winter makes this much worse as it’s a case of how many layers can you put on a wriggly baby and toddler before dragging them out into the cold? I find myself saying ‘Oh it looks like it might rain’ so often I swear they will become phobic of all weathers that aren’t mild and sunny (though not too sunny as that’ll involve Factor 500 suncream and hats and gallons of water). Admittedly, it’s easier to feed older babies on the go these days with ready-made milk and food pouches, but it’s the physcial time it takes to get out. By the time I’m ready to go out someone is hungry or needs changing. I promise myself every day that ‘tomorrow’ I’ll get up at 6am and be super organized, but it never happens. Just like after the birth, I know this will get a lot easier as they get older, but for now, the children don’t care so I might as well hibernate till spring! I can’t let go of my children’s toys! We’ve been having a bit of a clear out, which we need to do fairly frequently with six of us in the house. 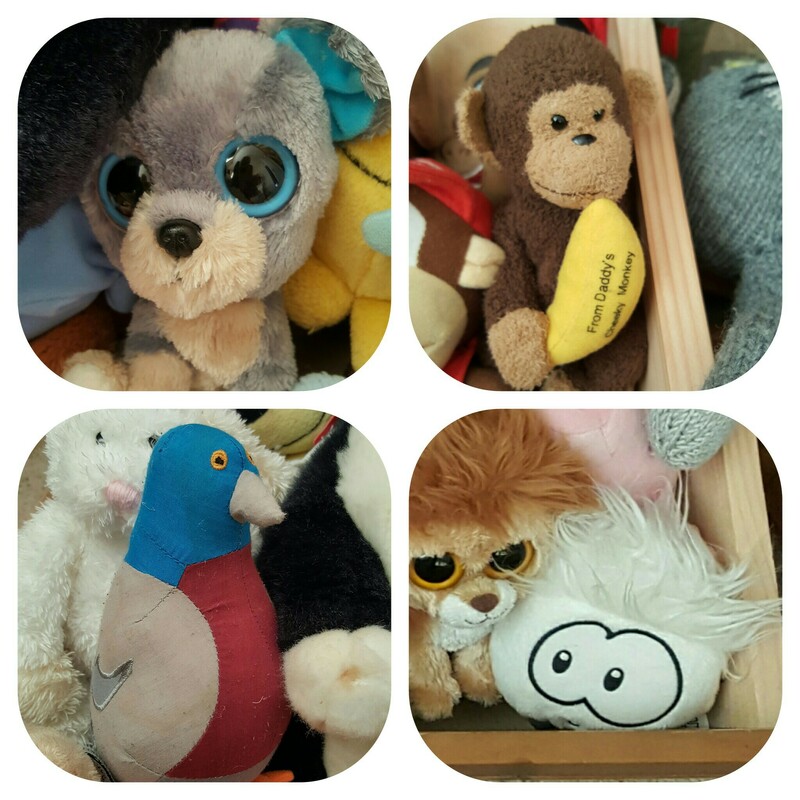 Our boys’ bedroom had become very cluttered with toys, clothes, books and teddies. We tidied it up but decided that as the large buckets of teddies weren’t played with much at all that we’d get rid of them. Ha, well it didn’t quite work out that way. These were toys we’ve become so used to seeing and picking up that we’d stopped appreciating them. But as we were putting them into bin bags for the charity shop, we were sighing sentimentally over almost every one of them. My husband was being more assertive about it but I suggested we put them aside so I could go through them again. So they were put into the baby’s bedroom to be ‘sorted’ later (aka taking the clutter from one room to another). Then we decided to store them in the loft for ‘another time’, only I didn’t want to do that as they might get damp or ruined, and I didn’t like to think of them all abandoned up there (can’t you tell I’ve been subjected to Toy Story on loop this past month!). So, a few weeks later, I sorted them out yet again! I found an old drawer under the cot and decided to put them all in there. After all Naomi might want to play with them look at them briefly one day! I did manage to make a bag of stuffed toys for charity, but I kept most of the ones we were originally going to put away or donate! What’s wrong with me. They are just toys! There are some that belonged to Abi, that I can remember her choosing, holding and us buying (lots of YooHoos, Moshi Monsters and a Puffle). 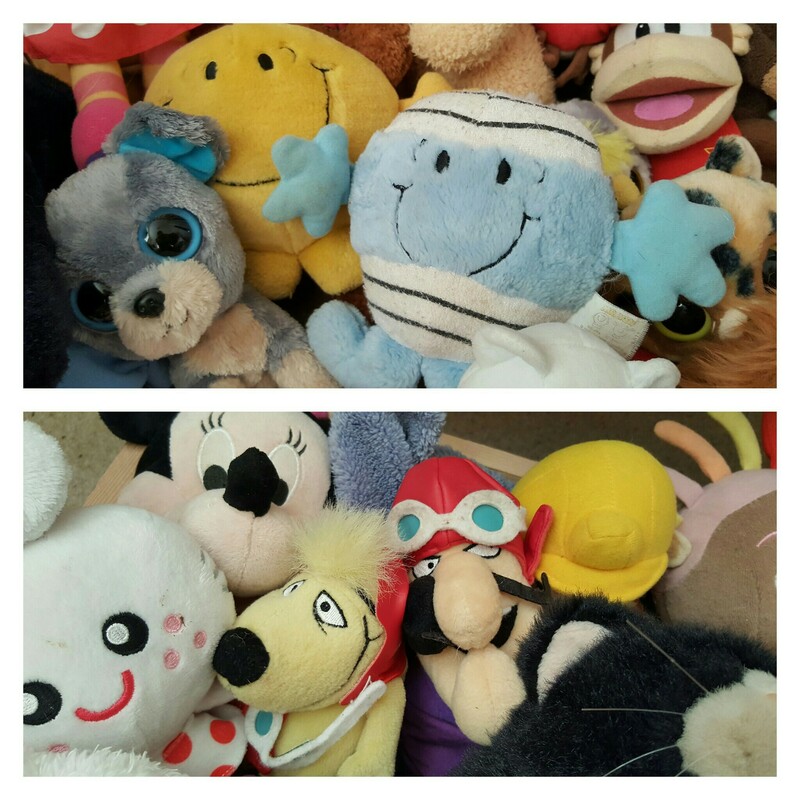 There are Beany Babies toys that we bought from the regular stall at the annual village fair. Nintendo toys and lovely soft Keel pets. There are toys that remind me of places we’ve been as a family (Pidgey Pidge the pigeon from our last London trip in 2012 for example). All toys that brought memories to mind. I can’t even store them away. I want them to be accessible even though I could use the space for other things. The children don’t look at these anymore. Jake, our toddler, might play with a couple (ie, empty the draw all over the floor and then abandon the game for another area of destruction!). They occasionally take one to bed, but really, who plays with all these stuffed toys anyway? They are such lovely things to buy but once you’ve got them home they just become part of the clutter. What makes it worse is that I was never a cuddly teddy or even a dolly kind of child, it seemed babyish to me. My Barbie had a professional career in the City (and also a beautiful ballgown in case the career didn’t work out and she needed a Prince Charming!). Though you wouldn’t think that now if you saw what has become my secret stash! 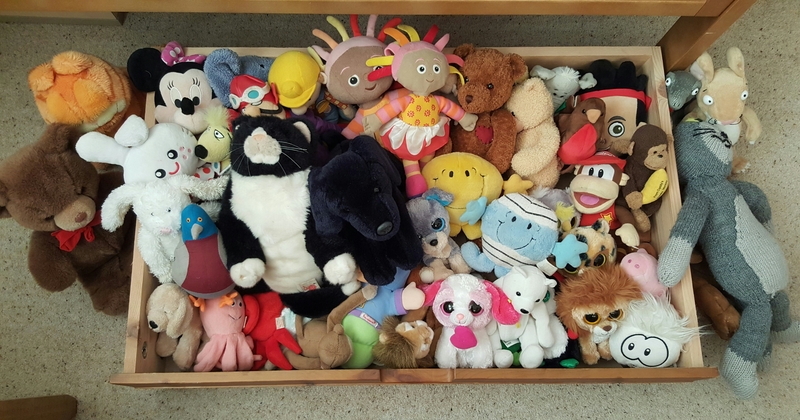 As I found myself unable to part with many of them, I had to accept that it’s my relationship with these toys, and the memories they give me, that is what is stopping me getting rid of them. What does it matter, they’ve been with us this long, they might as well stop a while longer! Tell me I’m not alone in this hoarding of kids’ stuff. Do you have any of your children’s toys you can’t bear to part with? 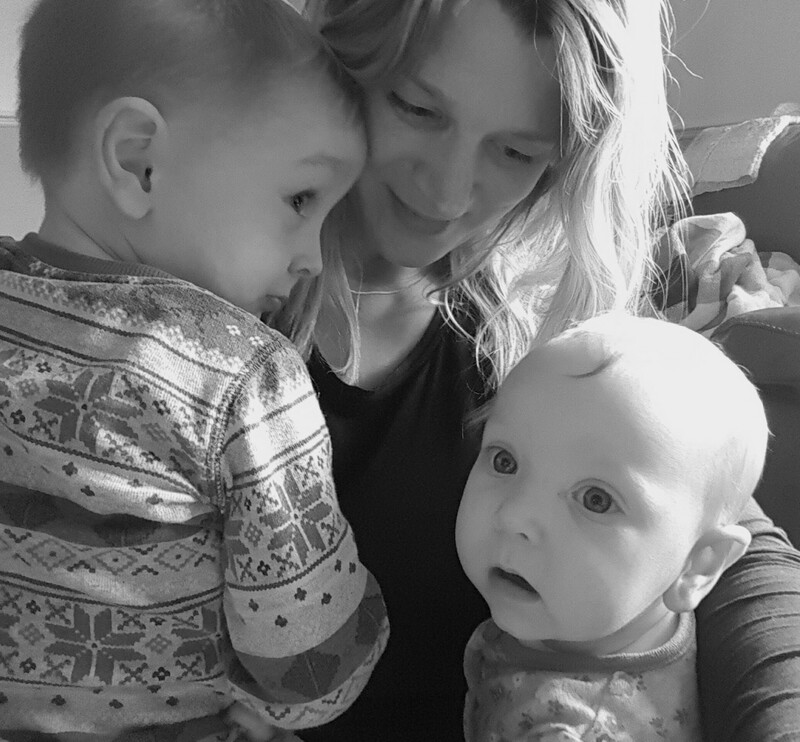 With having to stop breastfeeding Naomi, I knew I would feel sad about it – the transition to the next stage is always emotional. However, I decided I’d focus on the positives, one of which being able to leave her so that I could have a break. Six months with a baby 24/7, not to mention the nine months of pregnancy and three other children to look after is tough. And as much as I adore my children, having some time for me is essential to my mental well-being. So I’d asked my in-laws (who absolutely love spending time with their grandchildren) if they’d have Naomi for a few hours. They jumped at the chance and made it very easy for me to leave her. I knew she would get their undivided attention. I was unsure what to do with my day off. I had about five hours of freedom and I know all too well that this isn’t that long! I wanted to use the time wisely but also not overload myself. The hypervigilant mumma – will I ever switch off? So we’ve been a bit ill again. Jake’s been the worst hit this autumn. Normally a very healthy child, he’s had a chest infection, sickness and now another cold virus that has brought him out in itchy hives. On Saturday, I was home alone with Jake and Naomi. Daddy and Joe were at the football, and Jen had gone to a friend’s house. I was making a good dent into clearing up, as we have moved Naomi into her own bedroom, and I then needed to change Jake. As I was doing so I noticed raised red spots all over his legs which he wanted to scratch. I was quite alarmed as it’s most unlike him and he’d been eating well all day. I undressed him and found more of these strange red marks on his arms. Worried, I phoned 111 and within half an hour I was talking to the consultant on the phone. With Jake not having any worrying symptoms other than this itchy rash, she was happy that he didn’t need to be seen and said it was likely viral or a reaction to something he’d eaten. As he had had another cold, I put it down to that. It was what is called ‘nettle rash‘. Thankfully my sister lives close by so she was able to pop out and get me some Piriton and Calamine lotion. And, once dosed up, the rash started to look less angry. I phoned Daddy at the football game. While I didn’t want to disturb him, I knew that he’d want to know this had happened. He was understandably worried but I reassured him that I was keeping a close eye on Jake, who was watching all the telly and eating all the chocolate at this stage! As I sat there, I considered the state of hypervigilance we are living in. With young children, it’s natural to be anxious – it’s how we survive, but our personal anxiety runs much deeper now. I am so close connected to them that I almost feel everything they do, trying to absorb their pain or unhappiness. We are ready to act in an instant, we never switch off and we are always on guard. That’s not including the times when they get ill, when it goes into overdrive! Sometimes I feel like I might collapse with anxiety. It is exhausting – physically and mentally. The last time my hubby and I sat in front of the telly in the lounge with our children all in bed upstairs was around 4th February 2013, over three years ago. We always had a fairly reasonable bedtime routine for our three children. Upstairs around 8pm, get ready and then a story. As Abi and her sister shared a room, they often listened to the same story. Being just 22 months apart made bedtime easy. However, it was bedtime when Abi fell ill and suddenly passed into a coma due to a ‘catastrophic’ brain hemorrhage. At the time, I was reading a book to her sister while her dad was looking after her in our bedroom. Our son was already in bed and, though awake, was drifting off. It wasn’t that unusual for someone to be ill so there wasn’t much concern over Abi’s condition. This of course changed dramatically when she became disorientated and quickly lost consciousness. My hubby called me and I knew it was bad, though not as bad as it turned out. So, we went from a sleepy, unwinding bedtime to full-on panic, screaming, crying in a matter of minutes. Paramedics. Mum in tears. CPR. Lights on bright. Shock and trauma. If I dare to close my eyes I can still see and feel it all now so clearly. When we came back from the hospital a few days later, without Abi, we naturally wanted to reassure our son and daughter. Our daughter struggled at night in any case so I slept in her bed with her for about a week. Then we began to gradually fall into a new routine of all going upstairs together at bedtime and us reading to them and settling them before going across the landing into our bedroom and watching tv until we went to sleep. We’ve been doing that ever since, even with the arrival of two more children. Our bedtime routine is now at least two hours long, with play time and endless stories, and we rarely get into bed to start watching tv until 11pm. Then we watch a show and fall asleep around midnight before waking up in the morning and starting all over again. We’re knackered! We’ve always known it’s not healthy, but then, what is? We never thought it would be forever, but then it’s become the norm. A few months ago, I met a mum in the park and her parting words to me have stayed with me ever since: ‘It’s not all about the kids’. This is so simple and truthful, because while we’re busy giving our all to the children, physically and emotionally, because we never know the hour, we have very little left for us. Yesterday, our children’s counsellor asked us – ‘When will you be ready to sit downstairs again?’ We looked at each other. We’ve never discussed it. We just get through the days. But, she pointed out, drawing out bedtime and staying upstairs is only adding to our anxiety. We, as parents, are reinforcing the fear that something will happen to one of them, and they, as children, are getting the message that we are there because there is something to fear. So they aren’t learning how to cope, how to soothe themselves, how to get by without us. But there is something to fear! We saw it all up close and in detail. That crazy moment when the bright light of our lively, super-fit daughter was snuffed out, like that. No warning. No buildup. It’s inevitable that, in the aftermath, we are living on the edge… we all need reassurance! Yet, with two new children, the subject of routine is coming up. As every parent knows, routine is key. It doesn’t have to be military but a simple and consistent routine makes for a much happier family. Children like confident parents, they like structured discipline, it keeps them safe. But despite knowing all this, I feel it’s a hopeless cause. I can’t take my own advice! 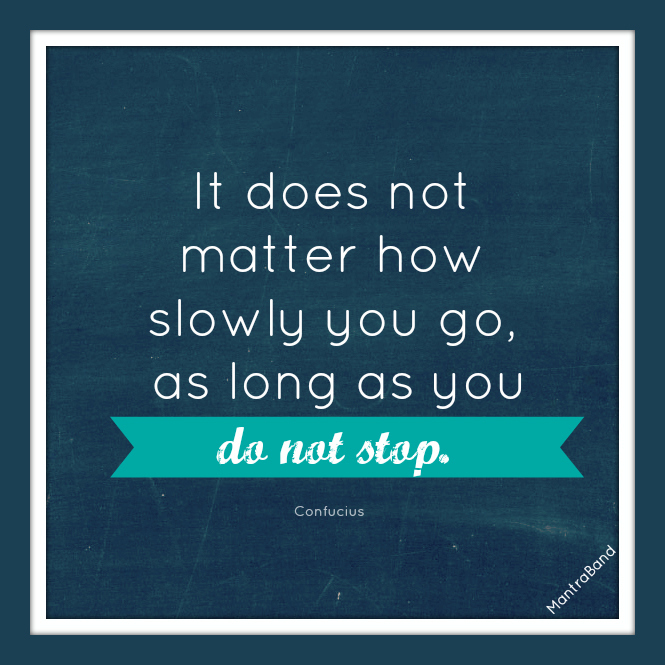 As my hubby and I had both discussed this with our children’s counsellor we saw this as a hurdle we needed to get over together. This is crucial as so often I am the one at the therapy meetings while my hubby is at work, and while I relay the things discussed it doesn’t make an impact if he hears it second hand. Last night we worked out a new plan; nothing too far off what we’ve been doing but much tighter in terms of timings. In grief, it becomes very hard to give a damn what the time is, so this demands a lot of emotional effort. My hubby took our 2-year-old up first at 7.45pm to put him to bed, with just one story. He shares his room with our 9-year-old son so has been used to going up with him. At 8.15pm, he took our 9-year-old up to bed and read him a couple of chapters from a book. He was at first insisting on the usual game of bedroom football, but my hubby was brilliantly firm and calm. Our toddler protested at the lights out so soon after his story and began to wail. We allowed our 9-year-old to read to himself with his small bed light. And then my hubby said good night, confidently, and left the room. I was settling the baby in our bedroom and saw him standing on the landing not really knowing what to do. Years of sitting with them in the darkness until he heard them sleep was hard to undo like that. But he went downstairs and made a cup of tea. The boys kept quiet and stayed in bed. At 8.45pm, it was our 14-year-old daughter’s turn. We like to read to her still and bedtime is a key time of day when she can talk about her day or her troubles – time that is essential at that age. But rather than doing this at 10.30pm when I was tired and irritable, I told her I was going to read to her at 9pm and then leave her to go downstairs at 9.30pm. And this was exactly what I did. I read, we had a quick chat, and I left. She did ask what if she needed me, and I simply said, we are downstairs. She got up to use the loo but didn’t come downstairs once. A good start! So, at 9.45pm I was sat on our sofa, with my hubby, watching a programme we’d been following (from our bedroom telly). And boy, was it weird! I felt like a child doing something I shouldn’t! I was uncomfortable, on edge and waiting for someone upstairs to call or need us. With four children up there it was inevitable that one of them would need something at some point. But no, it didn’t happen. I worried about the baby on her own, as she has never been out of my sight at night time. But apart from waking for a quick feed at 10pm, she was happy to settle down. Then I worried that they were all being too quiet, I know too well that it’s when they are quiet you need to worry. I can tell when my children are genuinely ill when they go quiet. Then, feeling fed up that I couldn’t relax, I went through a phase of thinking ‘Why are we bothering doing this? We can sit up there with them, it’s not doing any harm. We can start this tomorrow…’ the grieving mother in me fighting with everything to keep still and force myself to focus on the telly as if I didn’t have a care in the world. I was out of my comfort zone, and I realized that my comfort zone isn’t being chilled in front of the telly, it’s being on edge, tired and frustrated upstairs waiting for our children to call out. Maybe we can do this? It took a while, but we both gradually relaxed a bit more, we even cuddled up! We went to bed at 11pm, a bit too quickly as though we had been itching to get up there all along and back to our ‘safe space’. Before we went up, I began to think that I could get the last load of washing out of the tumble dryer now instead of in the morning. And I realized I could get my daughter’s packed lunch ready for the morning, rather than rushing like we usually do. And this made me realise that with hopefully better rested children and more time for us, we could go to bed feeling less like we are ‘fire fighting’ and more like we’re winning at this parenting lark. Each one of us should benefit from a more structured bedtime and mornings – where we are all tired – will be a bit less stressful. I am already exhausted thinking about doing it all over again tonight. It’s emotionally draining, feeling like we’re pretending to be assertive and like we aren’t afraid. But we have to consider the long-term impact on all of us by carrying on with our hypervigilance. I hope that in years to come, our children are able to understand what we went through to give them a stable home, and stability is one of the greatest gifts you can give to anyone. One thing I’ve noticed about grief is how selfish it makes one. Rightly so, of course, as grief is a personal pain that has to be endured by the individual – there’s nothing ‘giving’ about it. We cling to the memories, we absorb ourselves in the pain of our loss, we channel our energy into coping with how we are feeling – often to the detriment of others. In many ways, for which I’m thankful, Abi’s death helped me to be less selfish as a person. I had pursued my career running my business, giving all my spare time to it (in truth, it was my escape from the strain and monotony of family life). I considered myself an independent soul within my marriage. I did what I wanted. I deserved the things I wanted. I was dissatisfied if things didn’t go my way. I worried that what I had wasn’t enough. My priorities shifted completely when Abi died. I saw what was important, that living now was more important than waiting for the right time. That I needed to treasure what I had, not hanker after what I didn’t have. Despite the pain of Abi’s death, I am forever grateful she gave me that insight, because I realised that my life’s perspective had become totally skewed. But, confusingly, while grief has helped me to appreciate them more and the material stuff less, it has also pushed me away from them, as I try to cope with loss and protect myself from more pain. And this is more obvious to me (and them) when my energy tank is near depletion. Selfish mum is still there, it’s just that she’s selfish in a different way now. When I found out I was pregnant again in August 2015, my toddler was 18 months old. I wasn’t prepared for the news at all. I was in a vulnerable place emotionally and had just started to get stronger after a period of psychotherapy and finally starting on medication for my anxiety. I felt better for the first time in a long time. The foggy anxious-filled weeks and months after having my fourth child were fading and I felt more like me again. Yet here I was, given a gift I wasn’t expecting. A gift I knew was going to sap my emotions and energy even further and most likely throw me right back to square one. I asked God what was going on. If this was wise given my situation. If this was really what He wanted for me. I had just started to ‘get back out there’, to feel like I was controlling my ship again. My life wouldn’t be about serving Him, but about serving little people with big demands! I found I craved even more personal time alone – to think, to do the things that interested me (working, blogging, creating, zoning out), to do things my way. 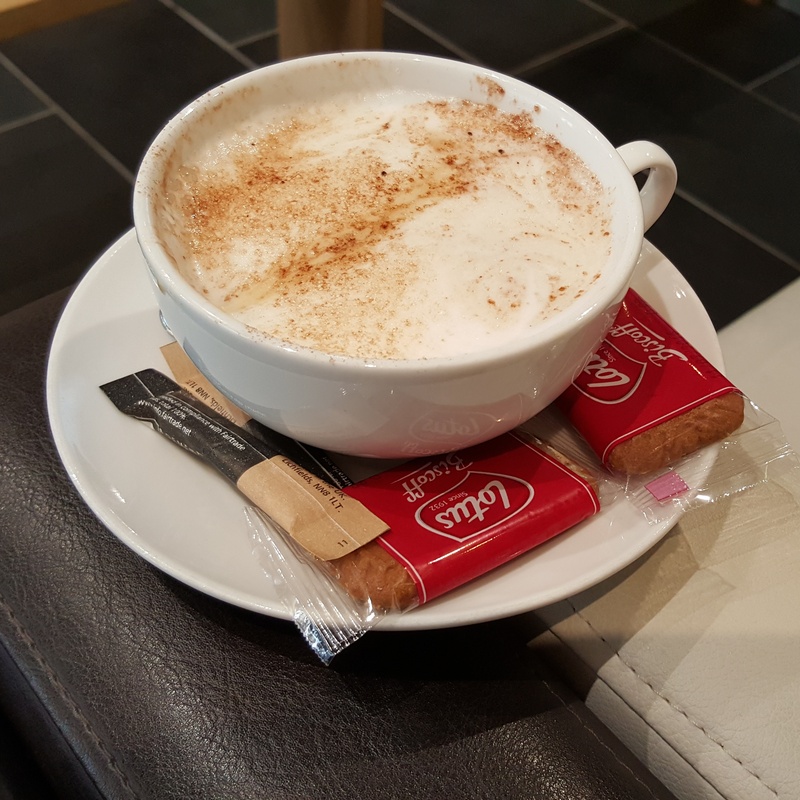 Now, my ‘me time’ isn’t about sitting down for five minutes with a book and a cuppa, my me time is more about having some emotional space from the constant worry and grief – being with my children and dealing with their own complex emotions is draining and me time allows me to shut off from that. Blogging is a big ‘me time’ factor that my family don’t understand. I need to write this stuff down to save my sanity some days! And as much as I love them, I found I wasn’t good at mothering them because I craved peace, time to grieve, time with my thoughts – I wanted to be mothered myself! The problem starts when that craving begins to overtake everything else. But God has given me another child. A fifth child. Me? Lord, don’t you know, I’m really not that maternal. I really don’t have that many hours in the day. I’m really not that good at this selfless parenting thing like other mothers. Yeah, I can do the baby days with my eyes closed, but once characters develop and cuddles aren’t enough and the challenging starts I find my head in the biscuit barrel wondering why I’m finding this so hard! My children need and want to be nurtured. It’s not their fault they were born and need me. It shouldn’t be that I resent them at times for that and then feel terrible, knowing all that I’ve lost! A perpetual cycle of mum-guilt. This post isn’t meant to be a self-pitying rant, it’s recognition of how intricately life’s web is spun and how making sense of the details helps me to understand the bigger picture. I was brought up in an insecure environment which made me self-reliant and only trusting of myself. I know I’m a deeply thoughtful and caring person, but I have an inherent fear that switches my ‘flight or fight’ button on at any given moment. With this new baby, I consider that God doesn’t want to give me the easier (for me) route of one-off giving such as helping a charity or someone in distant need, He knows I’d still have my selfish steak, that I’d still be wary of opening up to those I love most. He made me strong. He knows bringing up children with love, trust, selflessness and encouragement is what I need to build on, to show His love daily, and by doing so I will not only allow the better side of me to come through, I’d also be living my life as He intended, for Him. That’s not to say ‘me time’ isn’t important. I know that in order to give to them I need to feel as though I’m giving to myself a little. We all need time to ourselves. It’s about recognising that I shouldn’t get consumed by the need for me time so much that it affects my ability to give all the other times. That life’s pace is slower than the one in my mind. One day I will have all the ‘me time’ in the world and will miss the sound of my name being called for the umpteenth time. I’ll miss being needed! For now, I will remember that the joy is right under my nose! I’ll remember that I’m only human. I’ll remember that I am enough. I look back on this post and see all the ‘I’s and ‘Me’s I’ve written and how self-centred life has become. Yet I have been gifted with the most valuable treasures and I need to look after them. They depend on my love and love is the most important gift of all. This post was inspired by the wonderful Melissa over at Your Mom Has a Blog who wrote this thought-provoking post about ‘The Me Time Myth‘. In my weary, 8-month pregnant, sleep-deprived state, the weekend doesn’t appeal. As the chores mount up (and are harder to get through as bending and lifting becomes an effort), the children fight over what (irritating) TV show to watch all the while creating even more mess and work, the husband idling after a stressful week and still recovering from illness, three work deadlines to meet by Monday, worrying about finances and things I need to do but physically can’t… etc… I ask God to be my focus and I immediately get the amazing Psalm 127. In the midst of life’s distractions, it’s easy to succumb to the pressure, the sense of simply being overwhelmed, worrying about the future (I would hide under the duvet, if it wasn’t so uncomfortable to lie down with my aching pelvis!). God has shown me that, without Him, there’s no point. That He’s made me to deal with this, and more! God has always provided for us. He’s guided the growth of my business. He’s given my husband a stable job. I need to put the effort in and use the brain He gave me, but He always provides the opportunities for me to provide for my family. But I also need to allow myself to switch off and rest. To not worry about the provision, to trust that it will come. To be mindful of what – and who – I have now, today. Each of our children are blessings – the ones who never made it to birth, the ones who didn’t stay, and especially the ones who test us more than others. It’s not their fault they create physical and emotional work. It’s not my fault I’m too tired to deal with it all at times. They are not there to be worshipped and pampered, but to be moulded and shaped with love and healthy discipline, given space to find their feet within a loving home. Having another (fifth) baby is scary at times too, as I consider how I’ll cope, or not, with all the other pressures in my life. Yet this is God’s miracle and I must cherish it. I know we are truly privileged and I must try to ignore the practical stuff to see this, to see that I won’t always feel this tired, this weary. I must find a way to see the many blessings through the few trials. And God is the answer. This week, I attended my 8-year-old son’s parents’ evening. Like many parents at this time of year, I was keen and somewhat nervous to see how he was getting on. In the past, before my eldest child died, I was guided a lot by the grades my children achieved. Abi, my eldest child, always did very well. Effortlessly getting good grades due to her natural affinity to the school system and learning. My second child was similar; a good all rounder with a creative flair. My son has found learning at school harder to adjust to. As one of the youngest in his class, he was at a slight disadvantage to his peers. He’s bright enough and loves maths, but he’s not keen on writing or reading in a structured way. He tends to worry about getting things wrong and will simply ‘switch off’ when he can’t handle something. Yet he’s happy and his confidence in himself is growing all the time. When Abi died, my perspective on many things changed. Everything seemed insignificant… of course it was… but it was such a big thing to adjust to that no one warned me about. I suddenly didn’t know what to care about anymore. But as their routines didn’t stop, I needed to somehow find a way to continue to support my children’s schooling. Our children need to see that we care about all the things they do. Three years on, I’m in a fairly happy place with this now; my focus centres on my children’s overall happiness and wellbeing. The grades don’t really matter. Clearly, I see the value of learning essentials such as English and mathematics, but I’m not fussed about them achieving the ever-pressured targets set by the government. I firmly believe in a rounded education that includes sports, arts, faith, hobbies and just plain old having fun. It was something the teacher said that struck me the most about his progress. He was sat at a table with his peers and they were talking about God and Jesus. Everyone except my son said they didn’t believe in Him, they made jokes about Jesus and giggled about it. It wasn’t a deep theological debate this was just 8-year-olds having a chat. But my son went against their opinions and admitted he believed in God, and he said this with simple and honest courage in his convictions. The teacher noticed this and commented on it to us. A grieving mother’s bucket list – catching frogs and drinking good coffee! I recently bumped into an old friend, someone I’d not seen in around 20 years. We had a nice chat about the main aspects of what we’ve done with our lives, as you do, and we got onto the subject of fitness. My friend revealed she was entered into a marathon and was working out a lot to reach her targets. She also talked about some of the achievements she’d done in terms of education, travel and career. All impressive stuff! While she wasn’t being boastful at all, in fact I found her lust for life quite refreshing, it made me realise how my ‘big plans’ have changed. She quipped that she’d only a few things left to do on her ‘bucket list’ and would have to think of more. Clearly this woman was driven to try everything and anything, to feel alive and have a sense of accomplishment. But then she asked me what I would like to do, my mind went blank. She looked at me as though I was a bit strange. She looked at me a bit quizzically, like I had answered in a foreign language, and then changed the conversation and we soon after parted ways. While it was nice to see this friend, the exchange bothered me, for two reasons. Firstly, why my friend, who knew of my loss, wouldn’t instantly think that a ‘bucket list’ would not be top of my agenda, and secondly, why on earth did I not have a bucket list?! Am I really dull to not want to climb Mount Everest, see the Grand Canyon or swim with dolphins? Am I missing out on life by not running the London Marathon, going to Wimbledon or making a fortune at work? I used to have plans – places I wanted to see, things I wanted to do. I used to have a huge drive to succeed in business. I used to push myself in my fitness by entering races and striving to get fitter. I get bored easily, so I like change. I was always coming up with ideas or doing something just to keep life interesting. I am still a bit this way inclined, I like to have a project on the go and I’m sure the reason I live in a bit of a muddle is so that my life doesn’t feel ‘complete’. I don’t see myself growing old and happy to sit on the sofa all day, plumping pillows and only drinking wine with my Sunday lunch… I like life to be secure yes, but also a little bit crazy, compulsive and evolving. But my big plans changed the day we lost Abi, and it wasn’t until this encounter with a friend that I realised this. Abi was fit and healthy. She was hardly ever ill other than the usual bugs. She was a child of big ideas and adventures – when she was 10 she wrote a list of all the countries she wanted to visit (when she was married!). But, on 6th February 2013, within 30 minutes, she went from being well to slipping into the coma she would never wake up from. Life is fragile, so yes, it needs to be lived and appreciated, I know that more than most. Sometimes I feel I am slowly starting to think about the future and what I’d like to do with the life I have left, but because I’ve lost the secure feeling of thinking this will be more about me aging and being incapable than being alive or dead, I find it hard to plan much about what I do next year, let alone tomorrow! My happiness, my fulfilment, comes from pure love now. The family I have made. From my children – all of them, seeing them grow, learn and change (I avoid feeling sad because they are moving on to the next stage, I welcome them growing up because I know it’s a privilege!). I enjoy amazing sunsets, sunrises and skies. I love photographing nature. Tasting a delicious cappuccino. Feeling the rain on my skin. All the small things. 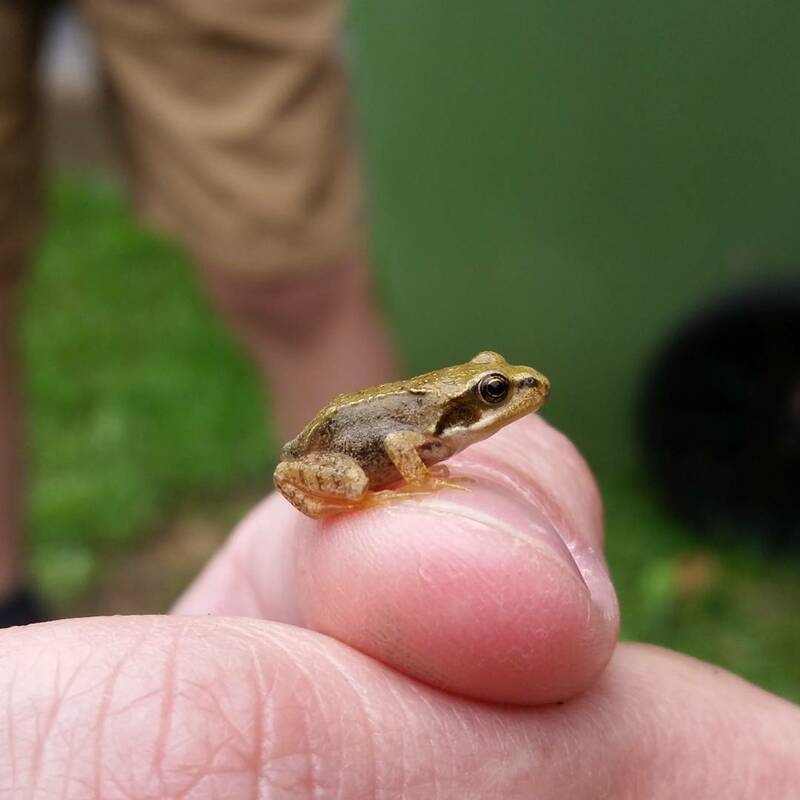 Today, for example, I found a tiny baby frog and put him on my finger and showed him to my boys. That was pretty awesome to me! My life is less about chasing dreams and more about appreciating the moment, because I will never know when it will be gone. The only thing I have on my ‘bucket list’ at the moment is to write a book – although if I’m sure I told my friend that, she’d have rolled her eyes and looked a bit vacant – everyone wants to ‘write a book’, how dull! But I would like to write a book based on this blog, a book for grieving parents to help them navigate some of the aspects of grief that aren’t obvious – things like this! I would also like to get fit again, although I’m focusing on yoga stretches at the moment to balance my mind rather than pushing myself to any physical limits, and I am more focused on my business at last so I’d like to see that grow further. Just because I don’t have a clear list of ‘do before I die’ does not mean that I don’t want to do anything! Quite the opposite! It’s just that I won’t live my life with a tick list. If I swim with a dolphin or run a marathon I’ll be delighted and feel a sense of achievement, but equally, if I don’t, I won’t feel like I’ve failed myself. Ultimately, my ‘bucket list’ is simply that I can live a long enough life to see my living children grow to be adults with families of their own: healthy, happy, faithful and loving. It might not be everyone’s idea of living, but it’ll do for me!